Three-day photography showcase brings together well-known speakers, product demos, parties, educational opportunities and much more. Imaging USA 2019 will be held January 20-22 at the Georgia World Congress Center in Atlanta. Imaging USA 2019, the largest annual convention and expo organized by professional photographers for professional photographers, will be held January 20-22, 2019 at the Georgia World Congress Center in Atlanta. In anticipation of this three-day photography event featuring more than 10,000 attendees and 80+ speakers and workshops plus 600+ booths from over 150 exhibitors, PPA has compiled a list of the "10 Things to See + Do at Imaging USA 2019." 1. 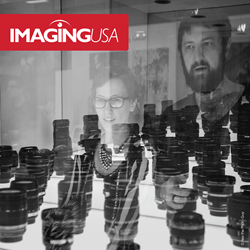 The Imaging USA Expo is where attendees can peruse everything from camera gear and equipment to small gadgets and accessories and establish a connection with labs and service providers. More than 600 exhibitors including photographic companies Canon, Miller's, Panasonic, H&H Color Lab, Marathon, Zenfolio and ChromaLuxe will display their products and services. 2. Opening and Closing Keynote addresses from motivational speakers Scott Stratten and Judi Holler. Imaging USA 2019 will be bookended with photography-business advice and inspiration from two of the best motivators in the world. 3. Renowned speakers in the photographic industry. 80+ of the best in the business will share their photography secrets inside in-depth class sessions. Imaging USA also features pre-convention classes, January 17-19, for even more intimate learning options including hands-on and full-day classes. 4. Educational opportunities for photographers of all levels. There will be live demos on the expo floor (like the PRINT Theatre), pre-convention classes, the Coaches' Corner for sports and event photographers, plus portfolio reviews and mentoring sessions in the Merit Cafe. 5. Opening Night Party inside the Georgia World Congress Center where Imaging USA kicks off the year with a night filled with dancing, mingling, and eating. Featuring unique photo ops and celebrating PPA’s 150th anniversary, the opening party is the perfect way to get ready for an amazing Imaging USA. 6. International Photographic Competition (IPC) Exhibit, the largest winter photographic exhibit in the Southeast. The IPC exhibit allows visitors to view some of the winning images from across the globe from 2018’s International Photographic Competition. 7. One Awards Night filled with three exciting ceremonies that are free and open to the public. Attendees can bring guests to cheer them on and help them celebrate their achievements. First up is the Award and Degree Ceremony, an official graduation for photographers earning their degrees and awards from 2018. Next, are the Grand Imaging Awards, honoring the best of the best from 2018’s IPC. Finally, the World Photographic Cup presentation celebrating Team U.S.A. in the World Photographic Cup. 8. During the Imaging USA Closing Party PPA will be taking over the Georgia Aquarium. Guests will eat dinner, take advantage of photo ops with marine life, and dance the night away inside the largest aquarium in the U.S. This event, while free to Imaging USA all-access pass holders, will require a ticket otherwise, which can be purchased at registration. 9. “Bridge the Gap” programming, the newest track at Imaging USA. Dedicated to helping bridge the gap between photographers and consumers, these classes take a deep dive into the small-business side of photography and aim to help attendees be more profitable in 2019. 10. Atlanta, GA, the hometown of PPA and the perfect spot to celebrate 150 years of photography by photographers for photographers. If they get a free moment, attendees can hit up the blocks around Imaging USA, taking in the Centennial Olympic Park area and all of the attractions within walking distance. Imaging USA 2019 will be here soon. Registration and room reservations can all be handled through the official booking site at http://www.ImagingUSA.org. Expo-only passes are also available and provide access to the Expo and keynote presentations. Professional Photographers of America (PPA) is the largest and longest-standing nonprofit photography trade association with a 150-year history. It currently helps 30,000+ pros elevate their craft and grow their business with resources, protection, and education, all under PPA's core guiding principle of bridging the gap between photographers and consumers.